4-Hour Work Week by Tim FerrissA dear friend and mentor of mine, Kathy Craven, sent me a link to a book on Amazon.com that she thought I'd like. 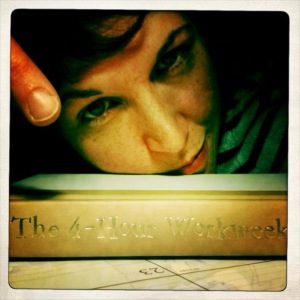 A few curious clicks later, I found myself 20-pages into Tim Ferriss' 4-Hour Work Week (4HWW). That very night I rushed to my local bookstore to pick up a copy and I haven't been able to put it down since. What would you do if retirement wasn't an option? Inactivity isn't the goal. Doing what excites you is! It's funny how we stumble onto things in life and attach meaning to them, even if they are just random happenings. Kathy didn't send me a link to the 4HWW... It was a totally different book. Yet here I find myself thinking about things - major life things - in a totally new way. Was it chance or something greater? In the spirit of the 4HWW, I accepted a challenge posted on Tim's blog to upload an image of me with his book to his Facebook page, tagging several of my friends in the image and inviting them to join me on the road less traveled. The first X number of people to upload the photo will win copies of the expanded 4HWW for them and their tagged friends. I would say wish me luck... but luck will have nothing to do with it!